Y’see, I’ve spent a lot of time in hospitals. I’m quite a klutz and spent most of my childhood falling and getting minor (and sometimes major) scrapes. I’ve been stitched up more times than I can remember. I used to say, “Well, at least I’ve never broken anything.” Then I fractured my ankle. Then I fractured it again. And, just for good measure, I did it a third time. Yes, the same ankle each time. In the seven years we’ve been married, my husband, the carpenter, has spent more than his fair share of time in the ER. Staples in his head. Pieces of his fingers getting stitched back on. That kind of thing. Not to be outdone, I’ve managed to clock a few hours in the ER myself, once or twice with seasonal asthma-related breathing issues, but I did manage to fall down a flight of stairs and get food poisoning (in the same week!) a year or two ago. My mother-in-law, however, has been the frequent flyer in the family and, since she lives with us, we spend countless hours getting her to and from the ER and visiting her in the hospital. As a sign language interpreter, doing emergency work in the ERs and hospitals is some of my favorite work. I know how overwhelmed a person can feel talking to a doctor when a loved one is ill, and knowing that I am providing a valuable service makes my job extremely fulfilling. In general, because of my experiences, I feel very comfortable in hospitals. Next week that will all change. Because next week, I will be the patient. (Pardon me if I don’t share all the details publicly. All I need to say is that it’s considered major surgery and, no, it’s not cancer.) I’m in my late 40s and my last surgery was when I was 7 (or was I 6?) and had my tonsils out. I’ve managed to come through 4 decades without doctors cutting me open. Even my son’s birth didn’t require a knife or any painkillers. (Well, at the time, I may have disagreed about the painkillers, but I didn’t get any.) Not counting tonsils, I have all my original parts – even my appendix. Maybe God figured I didn’t need any extra scars; I’d gotten so many as a kid. Obviously, I’ve reconsidered. I know the benefits outweigh the risks. Still, I will admit, I’m scared. One friend who had a similar procedure done told me, “I’d been in so much pain that recovery wasn’t bad. I felt so much better.” I understood what she was saying but, I’m not in pain. Not yet. But I will come out with pain. Luckily I’ll also come home with painkillers. I’ve been told I’ll sleep a lot. 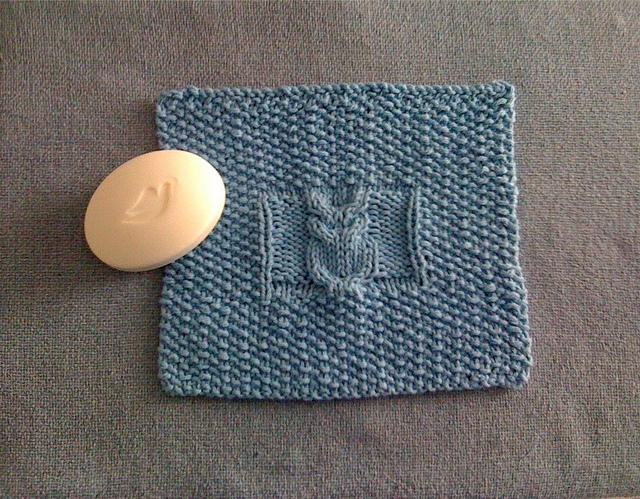 I was also told, by a fellow knitter, that I should knit a simple washcloth while I’m on painkillers, just for laughs. I’m considering it. Because, more than anything, I know it’s about perspective. I’m scared because I’m still on “this side” of the surgery. I don’t know what to expect. Once it’s over, I’d really like to look back on it all, maybe look at a washcloth, and laugh. ← What does this say about me…? I hope your surgery goes well. Perspective is what I’ve been trying for too at this time in my life. I’ve been reading about folks with chronic illnesses whom are in their twenties and thirties, like me, and how they manage the chronic stuff as well as the regular life stuff. As I get closer to surgery date, I’m trying to think of it in terms of “7 more days until my ‘vacation’ starts.” It’s working – sort of. But as you said, I know people with chronic illnesses, or disabilities that I don’t have to deal with on a daily basis and think, “MY ‘problem’ will be over soon. They can’t say that. I’m really very lucky. This is no big deal.” Of course, it IS a big deal any time something affects YOU.